Make the season even brighter, join us! 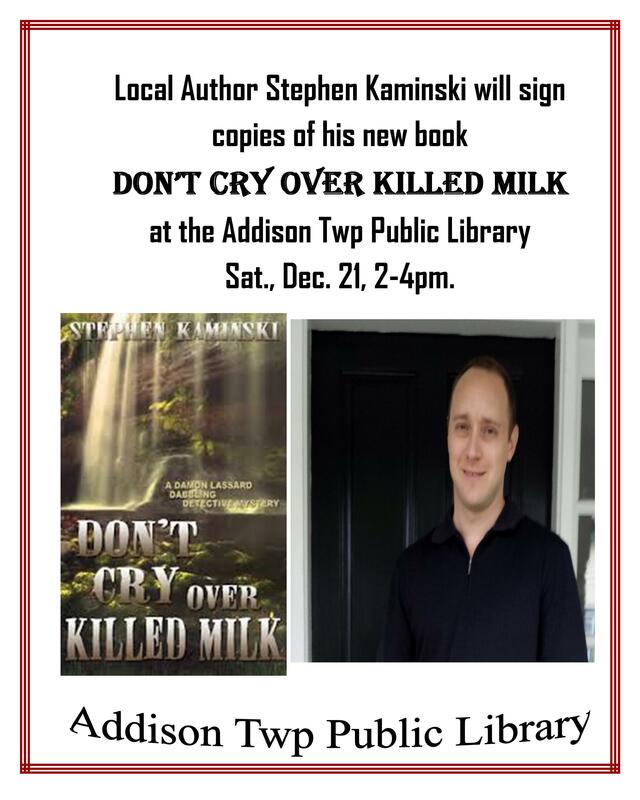 Author Stephen Kaminski is going to be at the Addison Twp Public Library this Sat., Dec. 21, 2-4 to discuss his latest novel, Don't Cry Over Killed Milk. He will also be signing copies of his books which will be available for purchase. Door prizes and refreshments will be provided! Locally, raised,  Mr. Kaminski is a lawyer and graduate of graduate of Johns Hopkins University and Harvard Law School. Stephen has practiced law for well over a decade and currently serves as General Counsel to a national non-profit organization. He is a lifelong lover of all types of mysteries, including cozies, and lives with his wife and daughter in Arlington, Virginia. His first novel, It Takes Two to Strangle is the 2012 winner of the Reader Views Literary Award for Best Regional Book (Mid-Atlantic).The author is the son of Art and Yolanda Kaminski who live in Addison Twp, MI.